The Passo delle Erbe description was originally written in collaboration with the inrng.com blog. The Dolomites are part of the Italian Alps and offer plenty of great cycling routes that are rich in race history. This month the site is sponsored by travel company Holimites and speaking to them about the best places to ride in the region I mentioned the usual suspects like the Passo Pordoi, Passo Giau and Selle Ronda but they came back with… the Passo delle Erbe. This might not have the celebrity status of other mountain passes but it is probably the most scenic and with several routes to the top, there’s variety. The Route: there are four routes to the top and this is about the most scenic and narrow route, the “Funes Climb”. It starts out of Chiusa/Klausen in South Tyrol in northern Italy, about 20 km northeast of Bolzano and 10km southwest of Bressanone/Brixen. 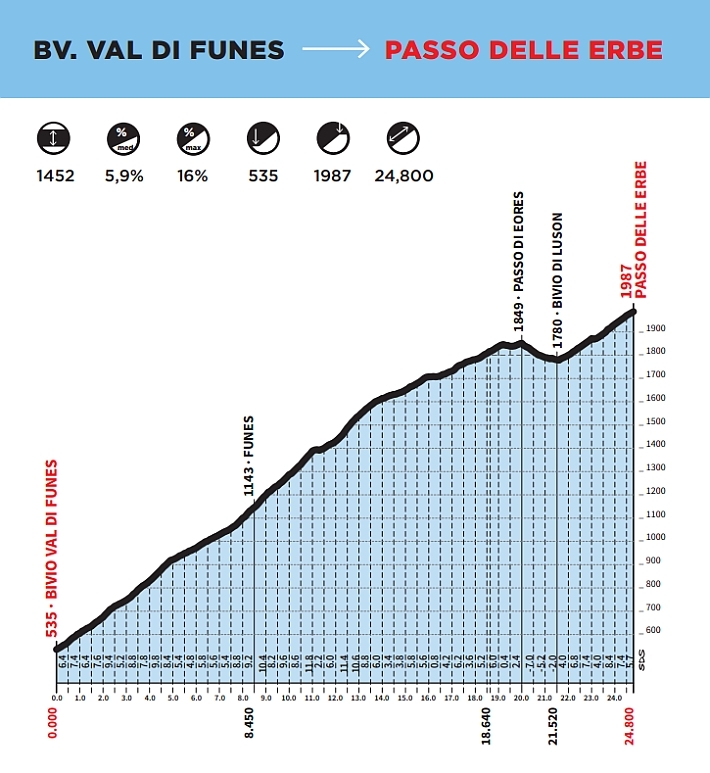 As the graphic above shows the climb is 24.8km long, climbs 1,452m at an average of 5.9% and maxxes at 16%. The Luson climb starts shortly north of the town of Chiusa/Klausen in the Val d’Isarco/Eisacktal where you just turn right following the signs to “Val di Funes”. 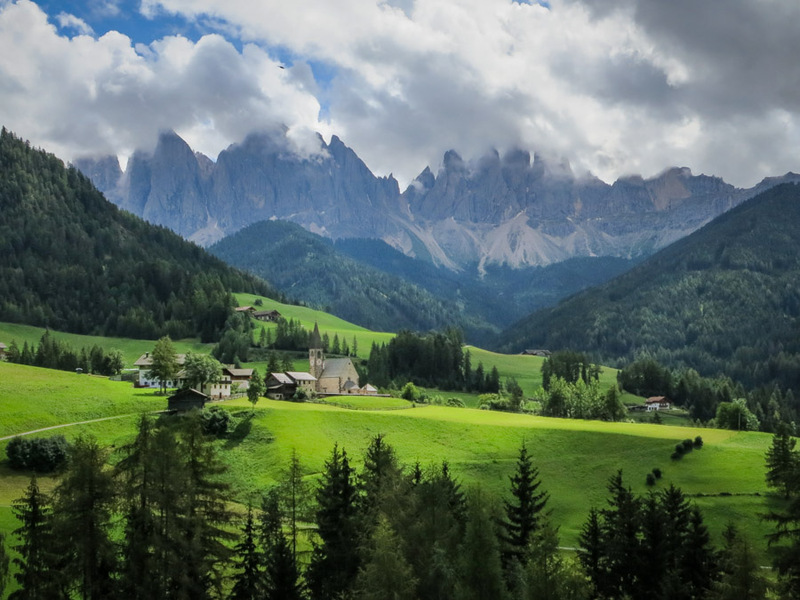 There is no sign pointing at “Passo delle Erbe” at this time as you will find this only once you arrive at the town of San Pietro di Funes, often abbreviated to Funes. The Feel*: As soon you live the Isarco Valley and turn into the Val di Funes you have cliffs hundreds of meters high on each of your side. You will find yourself in a canyon with just the road and a river on your right. This situation ends shortly after 1 km where you come out of this canyon where on the sun side of the valley you will see plenty of apple orchards. The first 8,5 km are easy and have a steady gradient. You can find your rhythm and have a glimpse at all the ancient and traditional south tyroleans farms you see on the road. Shortly before reaching the town of Funes the valley opens up and in front of you you get to see the first peaks of the Odle mountain range. At this point you may turn left where it will get serious and if you shortly before asked yourself “Is this all?” You will need to change your mind for the 10 km that follow. The road gradient start to have double digits, already reaching the town of San Pietro you get a nice ‘welcome’ with a 14% climb towards the little town square in front of the church. From San Pietro the road is narrow (2 cars don’t pass) and you get the first switchbacks. The climb is on the sun side of the valley and on a warm day you will be happy if you started this part of the climb with full water bottles in the town of San Pietro. A tip for the cyclists pedaling around the Dolomites: If you are looking for a water fountain, ride towards the town church where there is always a little square with a fresh fountain. After 11 km from the beginning you can take a little breath with a short flat part of less than 1 km, but then the gradient will start again to rise and you will get into the steepest part of the climb with a maximum 16% gradient. At KM16 you can breath again, at this point a cyclist that have power in their legs could start to push a bit but most cyclists will be done by the long climb at this point. At km 20 you arrive to the Passo di Eores that is not a real Passo, you are still not at the top but you may find some huts to take a rest. A short 1,5 km downhill follow before starting the last part towards the Passo delle Erbe and reaching the 1987 meters above sea level. So it’s for sure not the highest pass of the Dolomites but it is the one that have one of the longest climbs. Name: Passo delle Erbe means “Herb Pass”. You’ll have noticed mentions to towns often have two names, the Italian and German, for example the climb starts in a place called Chiusa in Italian and Klausen in German. The pass is also known as the Würzjoch in German which has a similar meaning, the -joch suffix is common for the passes. There’s a third language too, Ladin but here is where you will find it first, as the sign below shows. the Italian part is called South Tyrol in English but confusingly it’s Italy’s most northern region. 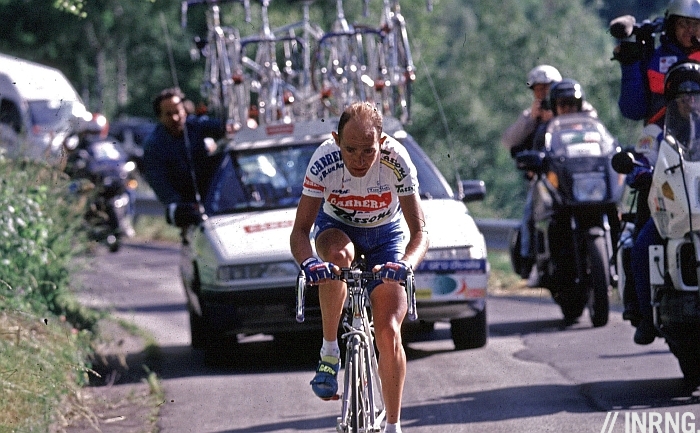 Giro History: the Giro has crossed in 1994 when Marco Pantani triumphed and returned in 2005 with a tribute to him. It was on the route for 2006 but heavy rains meant a last minute change. Where to stay: You can climb towards Passo delle Erbe on four sides. That means that you have plenty of combinations. 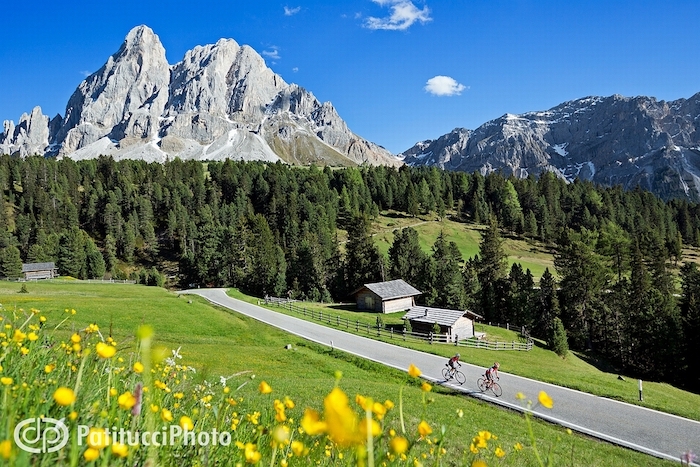 The suggested place to start riding the Passo delle Erbe is the Ladin side in the Val Badia valley, from where you have also access to plenty of the Dolomites passes like, Gardena, Campolongo, Falzarego, Giau etc. When to go: spring might start in much of Europe in March but for the Alps it comes later, some ski resorts are open well into April. Typically the Alpine passes start to open in May and the highest are ready by the end of the month. All this means a visit between June and mid-October is best. Access: airports like Venice, Milan, Munich and Innsbruck offer a range of connections and after there’s easy rail and autostrada access from there to the Dolomites. * Note: “The Feel” and the Hidden Gems text was written by Igor Tavella (@igortavella) who runs a family-owned hotel in the area and works with Holimites. I’ve not done this climb so instead Igor’s explained it instead. One little extra is the profile graphic above supplied by Igor. Look closely and you’ll see the initials “SDS”. This is Stefano di Santo who does all the profiles for RCS, look for his initials on the Milan-Sanremo profile and more and he’s produced the graphic for Igor.